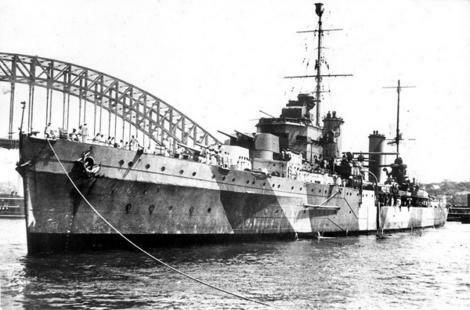 An Australian organisation, Finding Sydney Foundation believes it has found the World War II cruiser HMAS Sydney which was sunk after an engagement with the German armed merchantman, Kormoran. When last seen HMAS Sydney was ablaze on the horizon and it is believed she sank soon afterwards with the loss of the entire crew of 645. The Kormoran, which had been disguised as a Dutch freighter Straat Malakka also sank but not before 317 of her crew of 397 managed to take to the lifeboats and rafts. They were later picked up and told the story of the naval battle, describing the Australian cruiser as being ablaze and sinking. This was the single biggest loss of an Australian warship during the war and has remained a poignant reminder to Australians of all generations. The foundation announced at the weekend that the German ship had been discovered in waters about 2.5km deep, some 240km off Shark Bay in Western Australia, approximately 800km north of Fremantle. The search was undertaken under the direction of noted British shipwreck investigator David Mearns, who also found the battle cruiser HMS Hood and the German battleship Bismarck which sank in the Atlantic. “We have also located what we believe to be the battlefield site and there is an amount of wreckage there but that has yet to be identified,” said foundation chairman Ted Graham. He said the searchers now hoped this would lead to the Australian ship but added there was no guarantee of success. Then in startling fashion, Australia’s prime minister Kevin Rudd announced yesterday (Monday) that the Australian cruiser had also been found, about 20km from the wreck of the German ship. Describing it a “historic day for all Australians, and a sad day for all Australians” Rudd said he hoped the discovery would bring some closure to the families of the 645 sailors who lost their lives in the 1941 naval action. Australia’s navy chief, Vice Admiral Russ Shalders said that high resolution sonar images had confirmed the wreck as being that of HMAS Sydney. The announcement said that the German embassy in Canberra had been advised of the finding of the Kormoran, which would remain the property of the German people. HMAS Sydney would remain the property of Australia. Both ships are likely to be declared war graves.